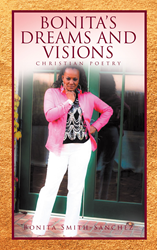 Recent release “Bonita’s Dreams and Visions: Christian Poetry” from Page Publishing author Bonita Smith-Sanchez is a book of inspirational verse with diverse themes such as love, faith, and forgiveness. Bonita Smith-Sanchez, a mother and inspirational poet, has completed her book “Bonita’s Dreams and Visions: Christian Poetry”: a deeply personal compilation of poems drawn from life, love, and an abiding faith in God. Bonita shares, “’Bonita’s Dreams and Visions’ is a book inspired by the life experience of both myself and my friends. The Bible says 'that if you confess with your mouth the Lord Jesus and believe in your heart that God has raised Him from the dead, you will be saved.' If we truly believe that in our heart and soul, we cannot take it back, so God will never leave us. We leave Him from fear of making mistakes or do God wrong when we don’t match up to other people’s expectations. Yet He knew we would not be perfect. "If Jesus said as men that we should not forgive seven by seven but until seventy by seven, then how much more will God our Father forgive if we try? You see, He created many ways to encourage our Christian journey. The Word, preaching, singing, music, and poetry. "On my Christian journey to find answers, I was studying with some Mormons. I stopped by their house to visit, and it was then for the first time in my life that I read 'Footprints' on their wall. When I got to the end, it read, 'He whispered, "My precious child, I love you and will never leave you, never ever during your trials and testing. When you saw only one set of footprints, it was then that I carried you." I cried like a little baby. "When I finally found what I was looking for (the Holy Spirit), He was just waiting on me just to ask for it. I began to write poems that inspired people like “Footprints” inspired me! Published by New York City-based Page Publishing, Bonita Smith-Sanchez’s book is a collection of deeply spiritual poetry offered to move and inspire. Readers who wish to experience this inspirational work can purchase “Bonita’s Dreams and Visions: Christian Poetry” at bookstores everywhere, or online at the Apple iTunes store, Amazon, Google Play, or Barnes and Noble.